I recently found a hundred-year-old recipe for Chicken and Ham Turnovers that is a wonderful way to use leftovers. The turnovers were yummy and easy to make, and the accompanying sauce added just the right amount of zing. Preheat oven to 400° F. Combine diced chicken and ham in a bowl. Set aside. In a mixing bowl, stir together the flour and baking powder. Cut in the shortening and butter using a pastry blender or two knives going in opposite directions. Stir in egg yolk and 1/2 cup milk. The dough should cling together and be of a consistency that it can be rolled. If needed, add additional milk. On a prepared surface, roll the dough out and cut into rounds approximately 5 inches in diameter. (I used an inverted cereal bowl to cut the rounds.) Place a heaping tablespoon of the meat mixture on one side of each round, brush water on the edge of round, fold over and press edges together. Put on rounds on a baking sheet, and brush with milk. Put in oven and bake until the top is lightly browned (about 20 minutes). Remove from oven and serve with sauce. While the turnovers are baking, make the sauce by melting the butter in a saucepan; stir in the flour and pepper. Add the ketchup and Worcestershire sauce, then slowly add the chicken broth while stirring continuously. Bring to a boil, then remove from heat. Posted on May 14, 2017 May 11, 2017 by SherylPosted in FoodTagged chicken, ham, recipe. This seems like a midwestern version of empanadas, which I dearly love. I’m not sure I’ve ever seen a chicken/ham combo like this, but it makes sense. Chicken alone might be a little bland, and require other ingredients to make the turnovers tasty. The chicken and ham complement each other nicely in this recipe. Your comment makes me want to try empanadas. Always looking for recipes for leftovers. This looks great. Thanks. You described the turnovers very nicely. So simple but good explains the decade this recipe came from. A hundred years ago, people generally ate most meals at home. and cooks often prepared three meals a day. They definitely valued recipes that were easy to prepare..
Not that long ago, my mom prepared food similar to those. She was a Native New Yorker who relocated to the Catskills in the late 60’s. I remember eating food prepared like this in the 70’s and 80’s. Even now, I prepare easy meals and use ingredients I have on hand. My mom’s greatest gift or one of them was teaching me simplicity and the beauty of using what you have with everything. I would season the filling a bit, maybe with a tablespoon of the sauce, but otherwise sounds like a tasty way to use leftover meats. I also was surprised that the filling was entirely meat – though it worked fine. The “smokiness” of the ham give the filling a nice flavor. That said, I think that adding a little of the sauce to the filling would be a delightful addition. Even 100 years ago homecooks were resourceful. This recipe sounds really good, and will come in handy for baked chicken Sundays! I agree- I’ve seen many old recipes that used left-overs. Cooks back then didn’t like to waste food. That sounds marvelous. Must try it! I’ve printed it out and have all of the ingredients on hand to try it. Those sound delicious and practical. Honestly, I sometimes likes meals made of leftovers the best! It is a nice way to use left-overs. In many ways this recipe seems unexpectedly modern. 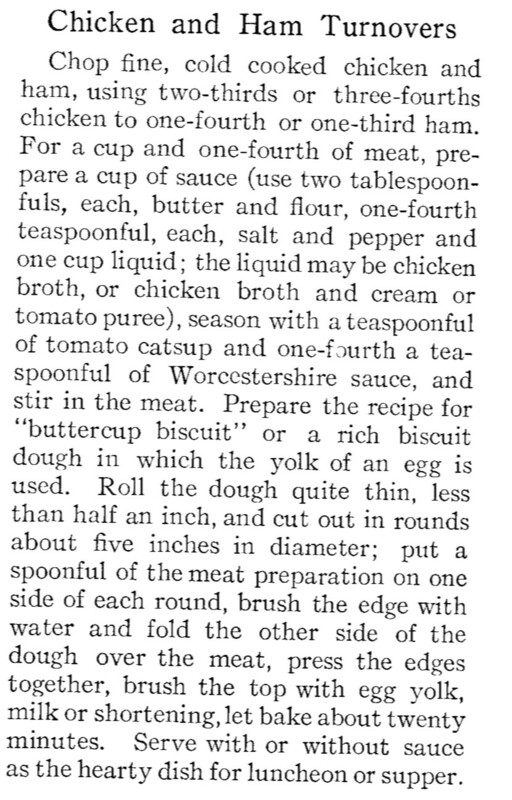 If I hadn’t found this recipe in a hundred-year-old magazine I wouldn’t have guessed how old it was. Looks like a great comfort food item. Yum! Absolutely gorgeously. Would love to give it a try! Holy cats, that looks delicious! The instant I saw the picture I started wondering if I had any ham leftovers in the freezer! I always have chicken on hand. This one is a definite keeper, Sheryl! Thank you! LOL My photos were originally taken on my phone and I didn’t know anything about fixing them. Now I use my camera and Photoshop but I’m still not very good. 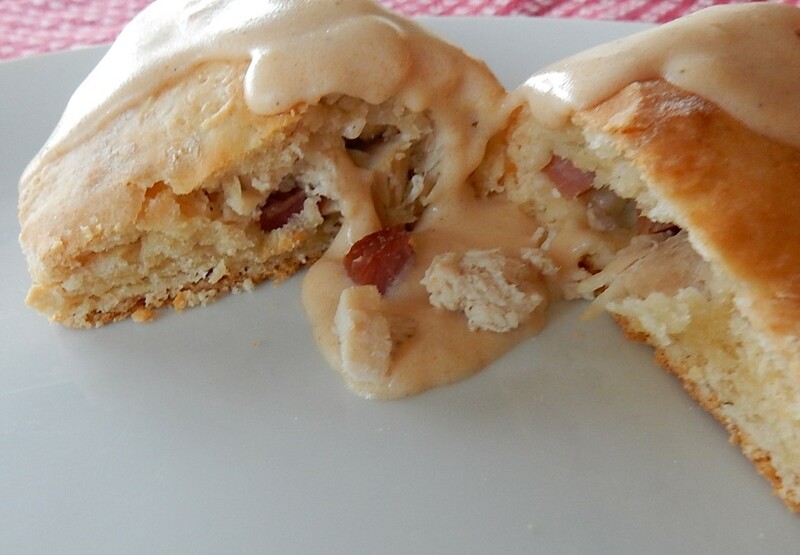 The instant I saw the picture of these Chicken and Ham Turnovers I knew I had to share Sheryl’s recipe! Reblogged on https://thecomfortablecoop.wordpress.com I know people are going to want to try this recipe! These turnovers sound absolutely fantastic! These look great. I don’t think I’ve ever had this type of meat turnover. I am always looking fun recipes for leftovers! This recipe looks so inviting & fun to make in the kitchen! 🙂 Yum Yum!